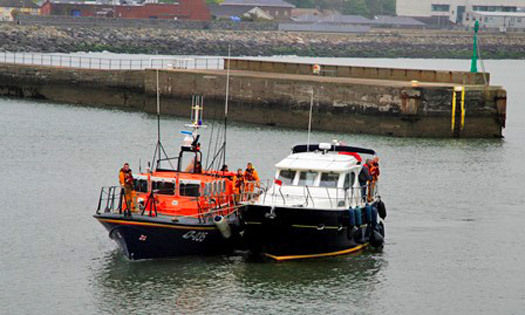 #RNLI - Wicklow RNLI's second call-out this bank holiday weekend – after Friday's early morning tow of a stricken yacht - saw two on board a 13m cruiser brought to safety early today (4 May) after their vessel suffered engine failure. The station's all-weather lifeboat was launched at 6.44am and located the vessel a short time later, two miles east of Wicklow Harbour. Volunteer crew member Terry Sillery went on board the motor cruiser to assist with establishing a towline. Weather conditions in the area at the time were blowing a westerly force three wind and there was poor visibility. The motor cruiser was on passage to Wales when it developed engine trouble. The owner put down an anchor so the vessel would not drift and contacted the Irish Coast Guard for assistance. The stricken motor cruiser was towed into Wicklow Harbour and safety secured alongside the East Pier at 7.40am. The crew on the call-out were coxswain Dave O'Leary, mechanic Tommy Murphy, Terry Sillery, Carol Flahive, Brian Sinnott, Connie O'Gara, John Vize and Alan Goucher.